Beyond providing data for all 32 NFL teams, PFF also supports network broadcasters with game-preview packets that are used to enhance the in-game experience for fans and viewers. 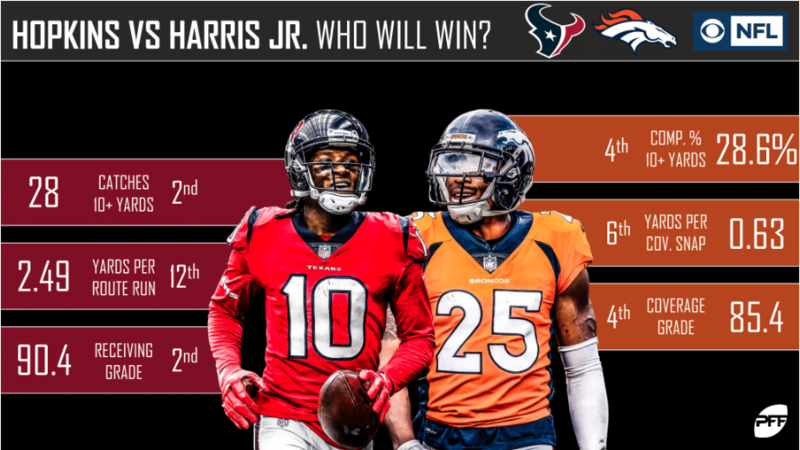 This Texans-Broncos preview features the same information our broadcast partners use for team research and in-game production. 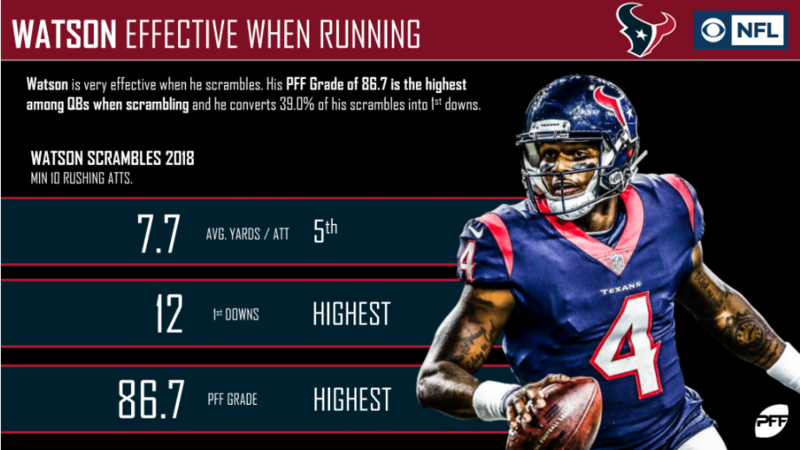 Deshaun Watson is well-known for his great scrambling abilities. He has a grade of 86.7 on plays when he scrambles, ranking first in the NFL. 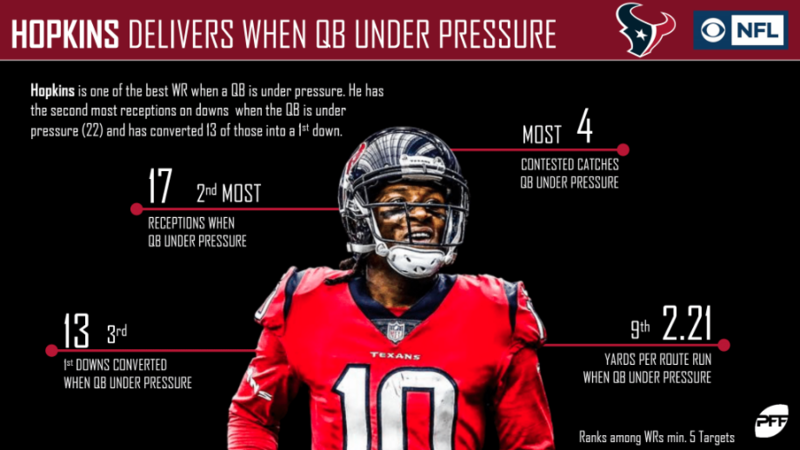 DeAndre Hopkins has converted 13 first downs when his quarterback is pressured, which ranks third among wide receivers. 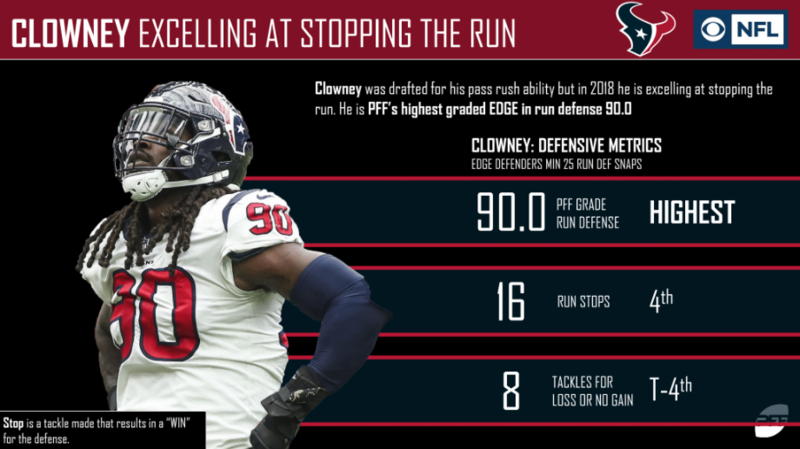 Jadeveon Clowney is the league’s highest graded run-defender at the edge position. He has 16 run stops and eight tackles for loss or no gain, both ranking in the top five among players at the position. In today’s NFL, good slot coverage is crucial. 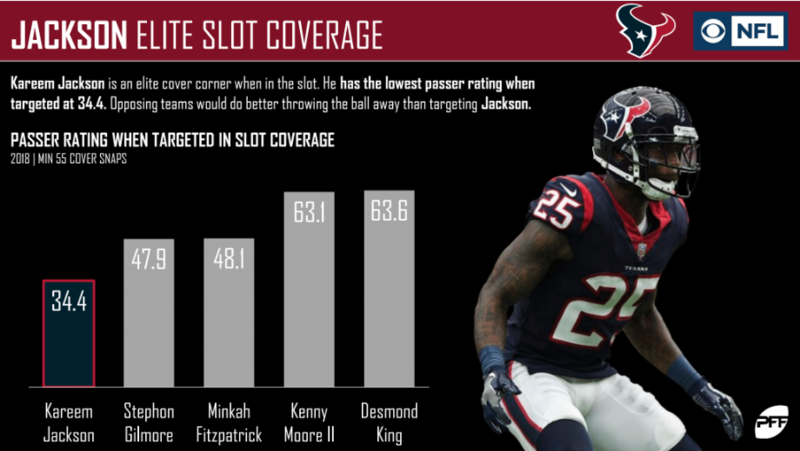 Kareem Jackson has filled that important need for the Texans, as he has allowed the lowest passer rating when targeted in the slot. 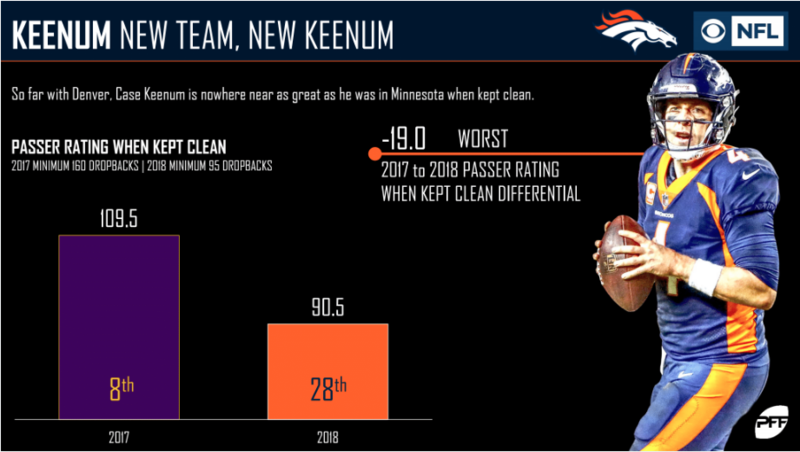 Case Keenum was brought to Denver because of his unexpected success in Minnesota. So far, Keenum hasn’t lived up to the hype. 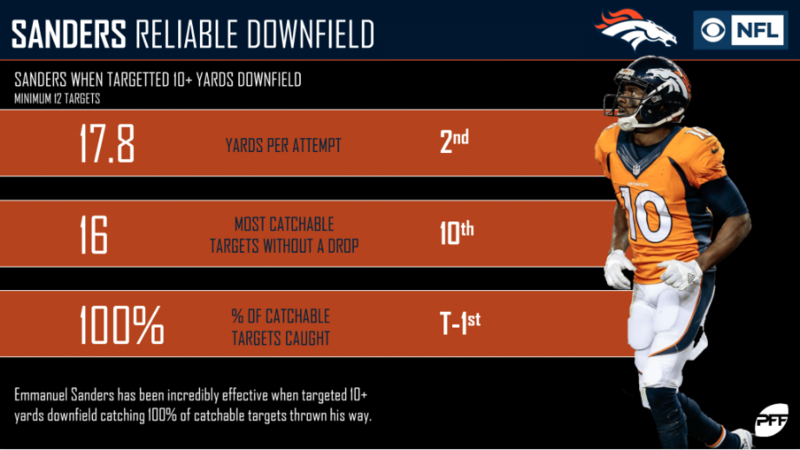 Emmanuel Sanders has emerged as the Broncos’ go-to wide receiver this year. He ranks second in yards per attempt when targeted 10-plus yards downfield and has the 14th-best overall grade among wide receivers (82.1). 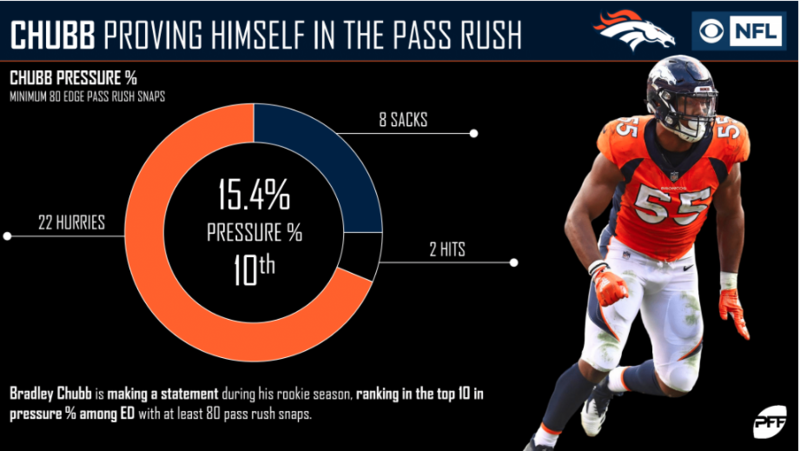 Bradley Chubb started the year off slow, but he now ranks in the top 10 in pressure percentage among edge defenders with at least 80 pass-rush snaps. He has tallied 22 hurries, two hits and eight sacks. 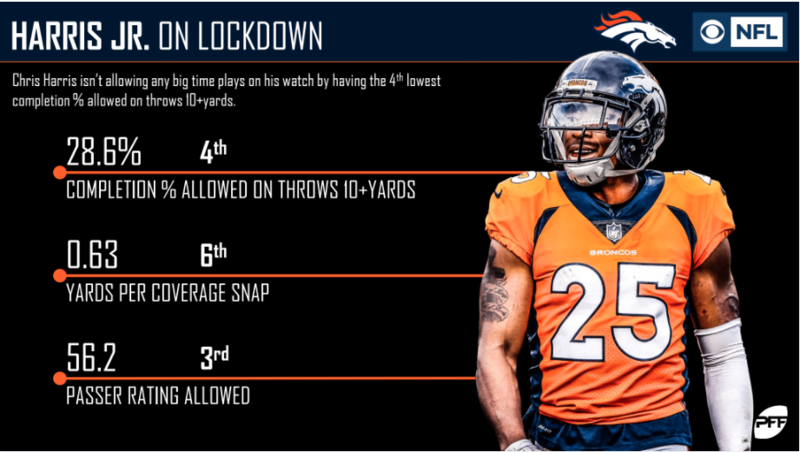 Chris Harris Jr. has allowed a completion percentage of just 28.6% on throws 10-plus yards downfield, ranking fourth among cornerbacks.